An odd combination, I know! I promise I won't try to combine the two, as that will most likely result in some broken china, and maybe a few tears. I went up to Nelson for the weekend, and come back with an interesting haul. 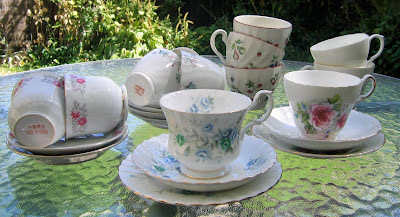 Twelve teacups, sourced from secondhand shops and a kind relative. Once I get some soy wax, I will make these into teacup candles. So if you see any that you absolutely love, and must have, let me know and I'll put it aside for you. I also brought back this antique silver plated candle holder that my grandmother gave to me when I was a teenager. 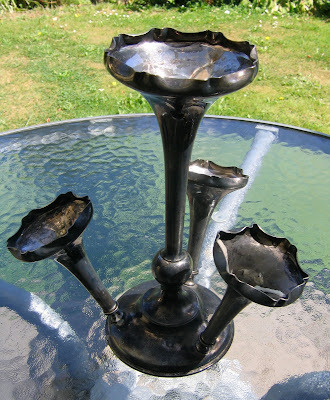 It needs a good clean, but I think it will look great with some of my hand-dipped beeswax candles in it. I also picked up a folding Raleigh 20 bike that was just hanging about, waiting for a new owner underneath my parents house. There are a few bikes there, most of which my brothers had raided for parts during their unicycle building/riding phase. This one was the most intact, it was only missing a seat and brake cable. So after a trip to a bike shop and Kmart for a new seat, cable, tyres and a basket, I'll be all set! It's other appealling feature was that it was much easier to fit in my car than one of the larger bikes. It's also blue, so it matches my car, other bike and my helmet! I won't post up pictures yet until it's all ready to go, as it is caked in mud and has a wheel removed so isn't very photogenic at the moment. In other news, I was made redundant from my job last week (I probably need to update my profile now!) The plus side is I will have more time to spend on my crafts. The downside is that it probably won't be able to pay all the bills for a while. So I'll try to spend a bit more time on it while I search for a new day job. What a great idea (re the teacups). They would look fantastic in villa style houses (well any really, but particularly that era!). I look forward to seeing your creations! New beginnings, how lucky :-) it'll be great for you to spend more time on your crafts.